Form Collapse widget: How can I set-up titles on forms that collapse down all the associated questions? I have done this on one form (Training Programme Application in our account) but I think I got this setting from a template. Can you advise how I do this for the other forms? I took a look at your jotforms and see what you would like to add. 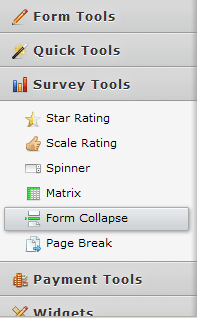 The widget you are looking for can be found under Survey tools and is called Form Collapse. Once you add it to your jotform you can set it up to show and hide certain widgets based on your preferences. You can see here 7 Useful JotForm Features You Probably Didn't Know About a short description of the tool, but if you have any questions on how to set it up, feel free to let us know and we will be glad to help you with it.